All health and no snacks makes Jack a dull boy! Yes, of course, what would life be without snacks. If you have so far lacked options that are gluten-free, then this is your chance to have your fill of the most delightful snacks, all made without wheat or its products! 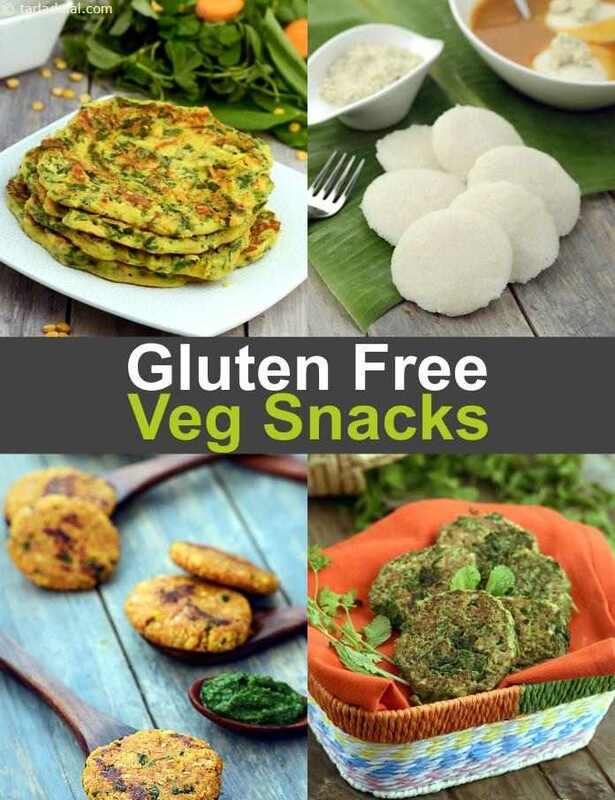 From idlis, dosa, tikkis and pancakes this section will pamper you with an endless choice of gluten-free Indian Veg snacks, which will comfortably answer your cravings. There are so many options for Gluten free snacks. From the basic Idli to Rasam Idli to Idli curry are there to be had with Gluten free Tomato Chutney or . Then there are a large collection of Dosas to have as they are made up of rice and dal. There is the classic Dosa to healthy Brown Rice Dosa to Poha Dosa to be had with Coconut Chutney. We present a range of Healthy Indian Tikkis from Sprouts Tikki to Oats Moong Tikki and Moong Dal Paneer Tikki to be had with Gluten free Pudina Chutney. Make sure your Oats are made in a facility where there is no cross contamination of gluten. We provide some great snacks or breakfast Oat options like Steel Cut Oats with Strawberry to Apple Banana Oats and Oatmeal Almond Milk with Apples. A scrumptious iron and fibre-rich snack made with fenugreek leaves and bajra flour, methi na dhebra is a hit with all age groups! served with curds, they make an ideal afternoon snack. Take my advice and make more than you think is needed!